“Big Money” Discovers the Huge Tax Breaks and Subsidies for “Wind Energy” | Mothers Against Wind Turbines Inc.
“Big Money” Discovers the Huge Tax Breaks and Subsidies for “Wind Energy” While Taxpayers and Electric Customers Pick up the Tab Recent events confirm that “Big Money” interests in the US and Europe have discovered the enormously generous tax breaks and subsidies that are now available in the US for producing electricity with wind turbines. These organizations are moving aggressively to build “wind farms” and to seek more subsidies. Meanwhile, as more wind turbines are proposed in the US and other countries, ordinary citizens have learned that “wind farms” are not environmentally benign. Instead, wind energy has high economic, environmental, ecological, scenic and property value costs. Wind turbines produce only small amounts of electricity and that electricity is unreliable and low in value. Quite likely, many members of Congress, state legislators, governors, regulators and local officials don’t yet realize that they have been misled about the true benefits and costs of wind energy – or the extent of their combined generosity to the wind industry. In the US, “wind farms” are now being built primarily for tax avoidance purposes, not because of their environmental, energy or economic benefits. The tax breaks and subsidies have more value to “wind farm” owners than the revenue from the sale of electricity they produce. These generous tax breaks and subsidies are at the expense of ordinary taxpayers and electric customers and are hidden in their tax bills and monthly electric bills. Government officials seem unaware or uncaring about either the large transfer of wealth to “wind farm” owners from ordinary citizens — or the fact that large amounts of capital are being spent on projects that produce only small amounts of unreliable, low value electricity. At least 10 large US and foreign companies are now working to build more “wind farms” in the US to take advantage of the exceedingly generous tax breaks and subsidies. Facts demonstrate that advocates have consistently overstated the environmental benefits and understated the environmental, ecological and economic costs of wind energy. The tax breaks and subsidies for “wind energy” already in place are providing huge benefits for a few companies but the wind industry is lobbying for even more. Despite the facts, it’s far from clear that legislators, local government officials and regulators will temper their enthusiasm for wind energy since so many have accepted as fact the false and misleading information distributed during the past decade by wind energy advocates. Also, they are well aware of wind industry lobbying power and campaign contributions. As indicated above, a number of large US and foreign companies (apparently with income to shelter from taxation), as well as law firms and lobbyists, have become aware of the enormously generous federal, state and local tax breaks and subsidies available for wind energy in the US. Presumably these firms are well aware that the government largess they are pursuing is at the expense of ordinary taxpayers and electric customers, but there is no reason to expect that they would work to protect the interests of either of these broad groups. Instead, their interests are in taking advantage of government measures to reduce their taxes and to increase their profits. General Electric bought Enron Wind’s wind turbine manufacturing business3 in May 2002, with the intention of capturing a large share of the artificial market for wind turbines created by the tax breaks and subsidies in the US and other countries. Gamesa, a Spanish manufacturer of wind turbines and developer of “wind farms” in several countries, in September 2002 acquired 75% of the stock of Navitas, a Minneapolisbased developer of “wind farms.” Gamesa companies apparently are proposing “wind farms” in Wisconsin, Illinois, Pennsylvania, and states in the Southwest. In early 2005, Gamesa announced plans to begin manufacturing wind turbine blades in Pennsylvania. MidAmerican Energy, 80.5% owned by Warren Buffet’s Berkshire Hathaway, 4 has also found the huge tax breaks and subsidies available for “wind farms.” Last year, MidAmerican completed roughly half of its originally planned 310.5 megawatt (MW), $323 million wind energy project in Iowa, which is being expanded to some 360 MW and $386 million.. The Omaha World Herald has reported that MidAmerican will reap roughly $300 million in tax benefits over 20 years from the project due to the federal Production Tax Credit, ($175 to $195 million) and forgiveness of Iowa property tax ($130 million). 5 Under the federal accelerated depreciation rules applicable to wind energy, MidAmerican should be able to deduct its entire $386 million capital investment from otherwise taxable income during the 2004-2010 tax years, thus reducing its federal tax liability by about $135 million during those years. 6 Those depreciation deductions from income can carry through and reduce Iowa corporate income tax by about $46 million during the same years.7 5. American Bar Association, in mid-2004, established a “Renewable Energy Resources Committee.”8 During a December 15, 2004, teleconference, Ed Feo – Milbank Tweed 3 Hadley & McCloy, LLP pointed out that 2/3 of the economic value of wind projects come from tax breaks.9 6. AES Corporation, on January 11, 2005, announced acquisition of SeaWest Holdings, Inc., parent company to, among others, SeaWest WindPower, Inc. which has “nearly 500MW of wind facilities throughout California, Wyoming and Oregon” and “…has site control of 1,800 MW of development sites in ten of the western United States.10 In 2004, AES invested in US Wind Force, LLC, which is developing “wind farms” in certain mid-Atlantic states. On April 5, 2005, AES announced that it had entered into a joint venture with EHN to develop wind energy facilities in the State of New York.11 EHN (Corporación Energía Hidroeléctrica de Navarra, S.A.) was acquired in January 2005 by ACCIONA, a conglomerate with headquarters in Madrid, Spain and a variety of operations in many countries. EHN is described by the company as one of the largest wind energy developers in the world. The company owns “wind farms” in Spain, Germany, France and the US. Goldman Sachs announced on March 21, 2005, that it is acquiring Zilkha Renewable Energy of Houston Texas.14 Zilkha is an “…independent wind energy development company, with a portfolio of nearly 4,000 megawatts in various stages of development in a dozen states. Goldman Sachs will acquire 100% of Zilkha’s interests in the 200-megawatt Flat Rock Wind Power Project in Lewis County, New York, as well as 100% of Zilkha’s interest in the 150-megawatt Blue Canyon Phase II Project in Oklahoma, both of which are expected to be completed by the end of 2005. Numerous smaller companies have undertaken the “on the ground activities” to force “wind farm” projects through state and local government zoning and permitting process. Often, they sell their projects off to larger organizations with profits to shelter from taxation. While government officials lavish tax breaks and subsidies on the wind industry, ordinary citizens around the world where “wind farms” have been built or are proposed are learning that the public, media and government officials have been badly misled about the costs and benefits of wind energy. As the facts are becoming known, opposition to “wind farms” is growing rapidly in US and other countries, including the UK, Germany, Denmark, Spain, Italy, France, Australia and New Zealand. Some 200 citizen-led opposition groups have emerged. These groups face an uphill fight in getting government officials to understand, accept and act on the facts about wind energy because the wind industry and other wind advocates have, for more than a decade, distributed false or misleading information to the public, media and government officials. The U.S. Department of Energy (DOE) and its National Renewable Energy “Laboratory” (NREL) participate in distributing such information – at taxpayer expense. There are at least 10 major reasons why “wind farms” have become controversial. These points are explained in other papers17 and on web sites and will only be described here briefly. Tax avoidance – not environmental and energy benefits – has become the prime motivation for building “wind farms.” The most important and lucrative tax breaks and subsidies are listed later. Briefly, the tax breaks include federal and state accelerated depreciation, production tax credits, and reduced or forgiven property and sales taxes. 2. Huge windmills – often taller than the US Capitol — produce very little electricity. Some 15,000 windmills are now scattered across thousands of acres of land in 30 states In the US, with total generating capacity of 6,740 megawatts (MW) as of January 5, 2004.18 If those thousands of windmills average a generous 27% capacity factor, the total amount of electricity they would produce annually would be 15,941,448,000 kilowatt-hours.19 That sounds like a lot of electricity, but it is equal to 41/100 of 1% of the electricity produced in the US during 2003. Electricity from wind turbines has less real value than electricity from reliable generating units, and detract from electric system reliability. Wind turbines produce electricity only when the wind is blowing within the right speed range. Today’s models may begin producing some they electricity at wind speeds of about 8 miles per hour 5 (MPH), reach rated capacity around 33 MPH, and cut out around 56 MPH. Because their output is intermittent, volatile and largely unpredictable, the electricity they produce has less value than electricity from reliable (“dispatchable”) generating units. Electricity grids must be kept in balance (supply & demand, voltage, frequency), so some reliable, dispatchable generating unit(s) must be immediately available at all times – and operating at less than peak efficiency and capacity — to “back up” the unreliable wind generation. The reliable, backup unit(s) must ramp up and down to balance the output from the wind turbines. Wind turbines detract from grid reliability and would be of no value in restoring an electric grid when there is a blackout. Further, when electricity demand increases, reliable units must be added to meet growing electricity demand even if wind capacity has been built. Wind turbines have virtually no “capacity value.” Thus, electric customers pay twice; once for the wind energy and again for reliable capacity. The cost of tax breaks and subsidies which shift tax burden and costs from “wind farm” owners to ordinary taxpayers and electric customers. The cost of providing backup power to balance the intermittent and volatile output from wind turbines. The full, true cost of transmitting electricity from “wind farms” to electric customers and the extra burden on grid management. Claims of environmental benefits of wind energy are exaggerated. The wind industry typically overstates claims of potential emission reductions that might result from displacing electricity generated by fossil-fueled generating units. They tend to ignore the fact that backup generating units must be immediately available and running at less than their peak efficiency or in spinning reserve mode, and that backup units continue to emit while in these modes. Also, the generation that may be offset may not be powered by fossil fuels. Further, under “cap and trade” programs, credits for sulfur dioxide or nitrogen oxides emissions that are displaced by wind could be sold to other emitters, with NO reduction in those emissions. “Wind farms” have significant adverse impacts on environmental, ecological, scenic and property values. Citizens in various states (and other countries) where “wind farms” have been constructed have become painfully aware that – in addition to the high true cost of the electricity — “wind farms” impair environmental, ecological, scenic and property values. Among the adverse impacts are noise, bird kills, interference with bird migration paths and animal habitat, destruction of scenic vistas and ecological rarities (such as the Flint Hills and Tallgrass Prairie in Kansas), distracting blade “flicker” and aircraft warning lights, and lowering the value of properties located near the huge structures. “Wind farms” produce few local economic benefits and such benefits are overwhelmed by the higher costs imposed on electric customers through their monthly bills. DOE, the National Renewable Energy Laboratory (NREL) and the wind industry have falsely claimed that “wind farms” provide significant economic benefits in the areas and states where they are constructed.20 They often claim benefits from the capital investment, jobs, 6 tax revenues, lease payments to landowners, and “other” economic activities. Sometimes they claim increased tourist traffic. Other subsidies are in the form of artificially created, high price “markets” for windgenerated electricity. These include guaranteed markets for electricity result from (i) insidious “renewable portfolio standards” mandated by several states that require electricity suppliers to obtain some share of their electricity from “renewable” sources, (ii) additional markets due to mandated purchases of “green electricity” by federal and state government agencies, and (iii) state programs requiring or encouraging electric utilities to offer “green” electricity at premium prices. Electric customers can elect to pay premium prices but these programs generally do not attract enough “volunteers” to pay the utilities’ costs of buying the “green” electricity and administering the program. The cost not recovered from customers paying premium prices is then spread across all of the utility’s customers and hidden in monthly electric bills. 9) The big “winners” are “wind farm” owners and a few landowners who lease their land. Electric customers and taxpayers are the big “losers.” First, as explained in more detail below, “wind farm” owners benefit enormously from the generous tax breaks and other subsidies that shift tax burden to ordinary taxpayers. “Wind farm” owners also benefit from the revenue from the sale of electricity while shifting costs (e.g., backup generation and transmission costs) to electric customers. Secondly, a few landowners who lease their land may be “winners” but their neighbors are the “losers.” For example, landowners who lease land at the rate of $5,000 per MW of wind turbine capacity would derive income of $500,000 per year. However, if that “wind farm” achieved a 30% capacity factor and the electricity cost consumers only an extra $0.015 per kWh, the extra cost to electric customers would $3,942,000 per year23 or nearly 8 times the income received by the few landowners. Thus, it would be cheaper for the electric customers to pay the landowners to NOT allow wind turbines to be built on their land! 10) The wind industry falsely claims that they deserve tax breaks and other subsidies because other energy sources have received even larger government-imposed benefits. Ideally, subsidies for all energy sources would be reduced significantly, but the wind argument is fundamentally flawed because it does not take into account either the existing or 7 potential contribution of wind energy in supplying US energy requirements. When the expected contribution of wind energy toward supplying US energy requirements is taken into account, wind energy is among the most heavily subsidized of all energy sources. EIA expects wind to provide less than 1/2 of 1% of US energy requirements by 2025. Misdirect hundreds of millions of investment dollars into energy projects that produce only small amounts of low value, low quality electricity. Transfer substantial wealth from ordinary taxpayers and electric customers to “wind farm” owners by shifting tax burden from “wind farm” owners to ordinary tax payers, and passing along the high priced electricity from “wind farms” to electric customers. Federal Accelerated Depreciation. One very generous subsidy available to companies with income to shelter is 5-year double declining balance accelerated depreciation (5-yr.; 200% DB) that can be used to calculate depreciation for tax purposes. This is one of the depreciation schemes permitted by the IRS under the label “MACRS,” Modified Accelerated Cost Recovery System.”24 Five-year 200% DB can be used for capital costs of facilities using wind to produce electricity for sale. Nearly all other electric generating facilities25 must use 20-year depreciation, so “wind farm” owners are receiving a tremendous benefit. In those states that “conform” their corporate income tax to the federal system, a depreciation deduction from otherwise taxable income carries through to the corporation’s state income tax returns. Determining the exact amounts of accelerated depreciation deductions would require access to details of a corporation’s taxes. However, as indicated on page 2, above, Warren Buffet’s MidAmerican Energy should be able to deduct from taxable income its entire $386 million capital investment in its 360 megawatt (MW) “wind farm” in Iowa during the period from 2004-2010. Assuming marginal tax rates of 35% for federal and 12% for Iowa corporate income tax, the depreciation deductions would reduce tax liability by $181 million during the period from 2004-2010. That is in addition to the roughly $300 million in tax benefits over 20 years from the project due to the federal Production Tax Credit, ($175 to $195 million) and forgiveness of Iowa property tax ($130 million) reported by the Omaha World Herald article referred to earlier. Federal Production Tax Credit. The second generous federal subsidy available to “wind farm” owners is the Production Tax Credit of $0.019 per kWh of electricity generated during the first 10 years of a wind project’s life. For example, at the current rate of $0.019 per kWh, owners of the proposed 150 MW Elk River “wind farm” in Butler County would receive a tax credit (i.e., a direct deduction from its federal income tax bill) of $9,986,400 per year if the turbines produce at an average 40% capacity factor (i.e., 150,000 kW x 8760 hrs. x .40 x $0.019). The rate, originally set at $0.015 per kWh, has just been adjusted upward for inflation, reaching $0.019 per kWh, retroactive to January 1, 2005. Organizations owning “wind farms” must have substantial taxable income from other sources to take advantage of the two federal tax shelters described above.27 That is one reason why small “wind farm” development companies often sell off their projects to larger companies or find ways to “sell” the tax benefits. Reductions in “wind farm” owners’ state corporate income tax liability. Kansas taxes corporate income at a basic rate of 4% with a 3.35% “surtax” for income over $50,000. The starting point in computing Kansas taxable income is the federal taxable income of the corporation. Thus the generous federal accelerated depreciation deduction described in paragraph 2, above, reduces the taxable income basis used before applying Kansas’ 7.35% marginal income tax rate. This benefit is even greater in states with higher corporate income tax rates such as Iowa, with a 12% rate. Property, sales and other state and local tax reduction or elimination. Thanks to the effectiveness of wind industry lobbyists, several states provide reductions or elimination of state or local property, sales or other taxes. These include New York, West Virginia, Wisconsin, Minnesota, South Dakota, and Kansas. In some cases, “wind farm” owners make voluntary payments in lieu of taxes to offset part of the revenue lost by state and local governments as a result of the exemptions. However, such payments may not be adequate to cover the costs that will be incurred because of the facility; e.g., for road construction and repair, and police and fire protection. Often, such payments are offered only in the early years of a project to help gain public and political support for approvals needed to build the facility, whereas property taxes would continue for the life of the facility. “Public benefit funds” As indicated above, several states have added an extra “tax” (often called a “public benefit charge” on electric customers’ month bills to create a so-called “public benefit fund.” States with such funds include Massachusetts, New York, Minnesota, Wisconsin, and California. State officials use some of these funds to make payments to owners of wind or other “renewable” energy facilities. These payments are in addition to all the federal, state and local tax breaks described above. “Renewable Portfolio Standards” (RPS). Such standards, in a variety of forms, have been adopted by about 17 states. Renewable Portfolio Standards (RPS) help increase consumers’ electric bills in two ways. First, they provide artificial, guaranteed markets for high priced electricity produced from renewable energy facilities, including “wind farms” assuring the owners of these facilities 9 that they will not have to compete with prices of electricity produced from traditional energy sources, such as coal, natural gas, oil, hydropower or nuclear energy. Second, a RPS typically establishes some minimum percentage of electricity sales that must come from “renewable” energy sources. The company selling the electricity to end use customers (often an electric distribution utility) can either generate the electricity from “renewable” sources, buy it from some firm that generates such electricity, or, perhaps, buy “renewable energy credits” (i.e., the scheme contemplated by the KEC.) covering the amount of electricity needed to meet the percentage standard. The higher cost of the electricity from “renewable” sources and/or the credits that the electric distribution company is forced to pay (instead of the lower cost electricity from traditional sources) is, in one way or another, passed on to electric customers in the form of higher bills for electricity – with the blessing of state public utility commissions. The wind industry is lobbying the US Congress to create a “national” Renewable Portfolio Standard and push additional states to adopt state standards. Mandated “green energy” purchases. Other artificial “markets” are created for the benefit of “wind farm” and other renewable energy producers by federal and state executive actions and, in some cases, by state statutes. In these cases, federal or state government agencies and state funded colleges are required to obtain certain portions of the energy they use from “renewable sources” even though the energy requires payment of above market prices. Relatively few electric customers volunteer to pay the required premium price, particularly if they realize that (i) their decision to do so would be largely symbolic and/or (ii) that other actions, such as using more energy efficient light bulbs, are much more cost effective and environmentally meaningful. As in the case of “Renewable Portfolio Standards,” the extra revenue generated by the premium price is generally not sufficient to cover the higher cost of the electricity and the cost of the staff that must be maintained by a utility to administer the programs. The utility’s costs that are NOT recovered through the premium price are then passed on to all of the utility’s customers. Industrial Development Bonds to Finance privately owned “wind farms.” A few states (e.g., New Mexico) have permitted “wind farm” owners to finance their projects using state backed bonds (“industrial development bonds”). Such bonds have interest rates that are lower than commercial financing, particularly because of their favorable tax treatment. Clearly, the wind industry – with support from DOE and NREL, using tax dollars – has been very successful in misleading the public, media and government officials about the benefits and costs of “wind energy.” These advocates for “wind energy” have grossly overstated the benefits and understated the costs but they have succeeded in gaining approval for tax benefits and subsidies that are proving to be enormous – and very attractive to aggressive “big money” interests. Even when they learn the facts, few political leaders have the courage to eliminate bad policies when those policies are “guarded” by large, effective lobbies and large campaign contributions. GLENN R. SCHLEEDE is semi-retired after working on energy and related matters in government and the private sector for over 30 years. He now devotes a large share of his time to self-financed analysis and writing about (a) government policies and programs that are detrimental to consumers and taxpayers, and (b) government or private sector activities that are presented to the media, public and government officials in a false or misleading way. From 1992 until September 2003, Schleede maintained a consulting practice, Energy Market and Policy Analysis, Inc. (EMPA), providing analysis of energy markets and policies. During that time he worked primarily on natural gas and electricity issues. Prior to forming EMPA, Schleede was Vice President of New England Electric System (NEES), Westborough, MA, and President of its fuels subsidiary, New England Energy Incorporated. His time with NEES included responsibilities for procurement and transportation of coal, natural gas and oil for NEES facilities, NEEI’s oil and gas exploration and coal shipping ventures, and NEES economic planning and budgeting functions. Previously, Schleede was Executive Associate Director of the U.S. Office of Management and Budget (1981), Senior VP of the National Coal Association in Washington (where he was employed from 1977-1981) and Associate Director (Energy and Science) of the White House Domestic Council (where he served from 1973-1977). He also held career service positions in the U.S. OMB and the U.S. Atomic Energy Commission. He has a BA degree from Gustavus Adolphus College and an MA from the University of Minnesota. He is also a graduate of Harvard Business School’s Advanced Management Program. Schleede is the author of many papers and reports on energy matters. His articles appear in various journals and/or are covered in the energy trade press. Some appear in full text on various public policy group web sites. Since 2001, Schleede has analyzed and written a lot about wind energy. The facts (a) convinced him that wind turbines are a niche technology that would never make a significant contribution toward meeting US energy requirements, and (b) demonstrated that the US DOE’s Office of Energy Efficiency & Renewable Energy (DOE-EERE); the National Renewable Energy “Laboratory” (NREL) and other DOE contractors, using tax dollars, distribute false and misleading information on wind energy. Schleede has been a frequent target of ad hominem attacks by officials from the wind industry as well as NREL and other DOE-EERE contractors. Their attacks seldom deal with the substantive issues he raises. AWEA and other DOE funded organizations (using tax dollars that flow through DOE-EERE) have claimed falsely that Schleede works for fossil-fuel industries. In response, Schleede notes that their claims are false and that ALL his work on wind energy has been self-financed. He has offered leaders of the attacking organizations (including NREL) the opportunity to review all his personal and business financial records, provided that (a) the work is done by an independent third party who can assure appropriate confidentiality of information and (b) the work is paid for by the individual and organization making the charges and is not reimbursed by DOE or otherwise paid for by using more tax dollars. 1 Citizens for Tax Justice, Citizens for Tax Justice, “Bush Policies Drive Surge in Corporate Tax Freeloading,” September 22, 2004, 68 pp. http://www.ctj.org/corpfed04an.pdf. 5 Gaarder, Nancy, “The power of the wind,” Omaha World Herald, March 26, 2005. 6 Assuming deductions of $386 million deduction from taxable income and 35% marginal tax rate. 7 Assuming deductions from taxable income of $386 million and an Iowa marginal tax of 12%. 16 For example, The American Council on Renewable Energy (ACORE). 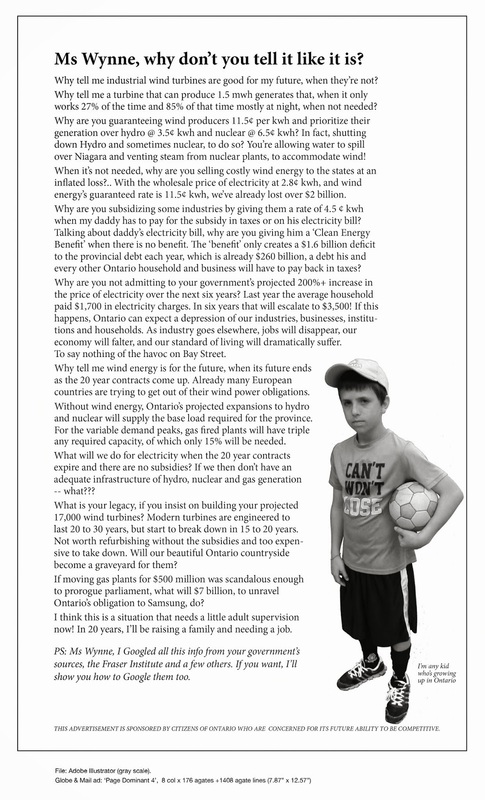 17 Schleede, Glenn R., “Facing up to the True Costs and Benefits of Wind Energy,” June 24, 2004 http://www.glebemountaingroup.org/Articles/aecifa~1.pdf; “Misplaced State Government Faith in Wind Energy,” March 1, 2005 http://www.glebemountaingroup.org/Articles/WindKansas030105.pdf. 19 That is, total capacity of 6,370,000 kW of rated capacity x 8760 hours per year x .25 capacity factor. 20 The National Renewable Energy Laboratory (NREL) recently released an economic model, called JEDI, that allegedly would permit calculating local economic impacts of a “wind farm.” Analysis of the model revealed that it is deficient in many ways and grossly overstates local economic benefits and understates economic costs. 21 Schleede, Glenn R., ., “Errors and Excesses in NREL’s JEDI-WIM Model that Provides Estimates of the State or Local Economic Impact of ‘Wind Farms’,” April 28, 2004. 23 That is, 100,000 kW capacity x 8760 hours per year x .30 capacity factor x $0.015 per kWh = $3,942,000. 24 See Internal Revenue Service (IRS) Publication 946 for details. 25 Simple cycle combustion turbines use 15-year, 150% declining balance depreciation for tax purposes. 26 If the “wind farm” was sold by the original owner for an amount larger than the remaining undepreciated balance, if any, the original owner could be taxed on the difference at ordinary income rates. 27 Often the desired result is achieved when doing accounting for tax purposes by consolidating the financials of parent organization, subsidiaries (including limited liability companies) and/or affiliates (e.g., shares of partnerships or joint ventures).